Before I begin any new projects (and believe me, there's a looooonnnng list of to do's) I'm going through the sewing room and looking for unfinished Christmas projects from last year and putting together a plan to either complete them or otherwise dispose of them. Remember this UFO from last year's Christmas Wrap-up blog entry? 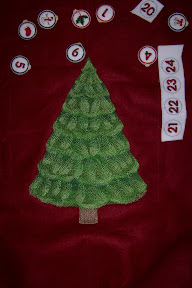 This is a Christmas Tree Countdown Calendar from Embroidery Library. The tree is actually embroidered from three separate embroidery files because it is so big. It took most of a Sunday afternoon, but it was so cool to watch the segments of each file line up to form one giant tree. 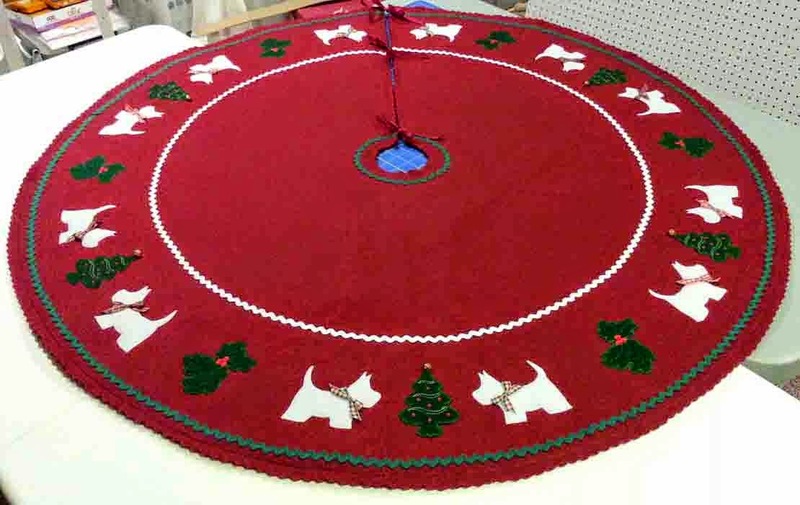 The instructions from EmbroideryLibrary for this Christmas Tree Countdown Calendar are very good. I'll bet one of those newer embroidery machines with the gigantic hoops could stitch it in one hooping. I simply ran out of time last year and did not complete the last six ornaments for the countdown. A few nights ago I was able to finish the embroidery for the last few ornaments. Next, I'll try to cut them out of the felt and then finish the wall hanging. I'm not sure yet if this will be a gift to give away or for us to keep. I'll post an update later. There were a few other projects I wanted to make last year and, silly me, I thought I would try to work on one UFO each month to get them all done before this Christmas. Hah! I didn't even look at them once this year, and I'm not sure I even remember them all now, since I didn't bother to leave myself any notes. I did, however, pack up most of the supplies for a few projects, each in it's own sweater box, so making a list of UFOs shouldn't be too hard. One of the projects I do remember wanting to make last year is this pair of stuffed ornaments from Designs in Machine Embroidery magazine's Sept/Oct 2007 issue (Volume 46). 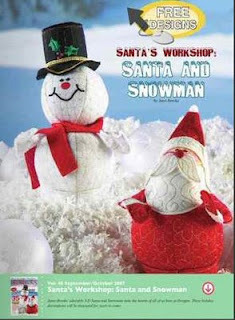 In fact, making the Santa and Snowman were the main reason I bought extra felt last year. The designs by Janet Brooks were on the cover of that issue and were available as a free download in 2007; the project instructions are still available for download from the magazine's website, but the embroidery designs don't seem to be available, at least I can't find a link for them on the re-designed site. Hopefully, I downloaded all the files needed last year. UPDATE: The embroidery designs and instructions are available for download in the Designs Plus Newsletter - July 2010. I found one other box with UFO holiday projects from 2007 - remember the Swirling Autumn Leaves In-the-hoop potholder from last year? 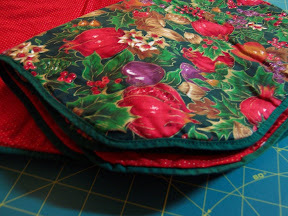 I ended up buying a Christmas Potholder design pack, but didn't get around to making any of them in 2007. The plan was to use up the odds and ends of Christmas fabrics, pre-quilted remnants and batting from my stash to make these for gifts. If I don't get to them this year, I may not ever get around to making them. In the same UFO project box, I found these old placemats -- or what I call my sorry attempt at making Christmas placemats from somewhere around 1995-ish. Here is a perfect example of why I've always said I'm not a quilter. As I remember, the instructions were in one of the craft magazines I subscribed to at the time and they were supposed to be "sew easy" because the binding was attached by ironing a fusible tape to it before topstitching in place, almost a no-sew project. Well - the fusible I used back then was a Heat 'n Bond lite product and I remember having all kinds of trouble trying to wrap the binding around all the layers; it kept slipping and fusing to itself. It never occurred to me to quilt the fabric pieces before attaching the binding; for that matter it never occurred to me to buy wider binding or make my own or sew on the binding instead of fusing it because I always followed the instructions. 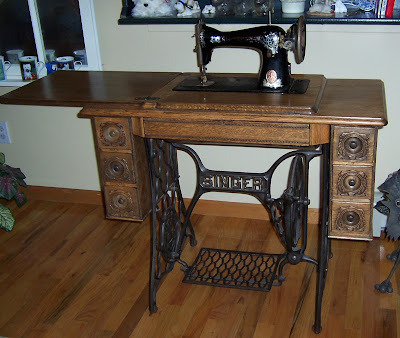 Even if I had tried to quilt the pieces, I didn't have a walking foot for my old sewing machine. I've always been disappointed with these things, but couldn't bring myself to just throw them away because that would be too wasteful, so I've been carrying them in the stash all this time. Actually, now that I think of it, it's kind of cool to compare them to projects I've completed recently and realize how much I've learned in the past few years. Last year I thought I might cut them up and use the parts for the in-the-hoop potholders. I'll have to throw away the bindings now, they're covered with glue from the old fusible and are stiff and yucky. But the fabric and batting are in good shape. Whatever I don't use for in-the-hoop potholders, I will use to practice quilting, both free motion and with machine embroidered designs. At least now I have the right tools and quilting experience (however limited) to make it work. So -- the plan is to work on these projects as much as possible between now and the end of this year. Or at least for the next two weeks. There's a good chance I'll work on totally different projects if the mood strikes me. I *do* still need to make raincoats for the Westies (I got the pink pleather in September as planned), and Penny has grown out of last year's fleece coat so she'll need a new one if it gets really cold soon. And, I have an idea for posing them for a Christmas photo that requires Santa and Elf coats. And you know, there's always something . . . . . . .